I've been doing a series of posts about ethics in complex spaces such as MOOCs, and I was planning to do this particular post near the end, but then #rhizo15 started, and I read some things that made me think that this was the correct time to speak. Kairos can be insistent, but it is also short-lived. Much of what I've been saying about complex ethics has been rather abstract. Really, provisionalism, transgressivity, irony, and imagination don't provide the kind of concrete guidance we expect from ethics, and I have the feeling that no one will be much convinced if I don't provide some list of rules. You know, a Ten Commandments—or six or so—something like that. I'm hesitant, but then … what the hell. Let's make some commandments. The lack of an explicit, GIVEN syllabus and objectives provokes both desire and aversion in almost equal measure. Desire because it is liberating (more on this in a moment). Aversion because my inner voice is screaming: “BUT WHERE’S THE MAP? WON’T YOU GET LOST? WON’T YOU MAKE A FOOL OF YOURSELF BY NOT GETTING THE RULES OF THE GAME?”. [I]n Connected Courses, I established a learning goal completely separate from anything being offered (I wanted to learn how to establish a network that would allow me to advertise my intention of doing research on the Connected Courses experience – as part of an ethical approach to Internet research) and then I found Maha Bali, who became the best supporter/teacher/friend that [a] learner-researcher could ever want. It was a great experience. … So if you want a #rhizo15 buddy, know that I’m around and I’m looking for one myself. Here's the heart of the matter: offer to be somebody's buddy. It really is the only way to join and navigate a swarm. My western culture values too much the gunslinger, the raptor, the shark, the lone wolf. As a raptor, you might kill a few swallows from time to time, but you will never, ever be part of the swarm. If you want to join a swarm such as #rhizo15, then don't be a raptor, or a troll. Rather, find a buddy and graft on. Then, earlier last month, my good friend and Southern Humanities colleague Linnéa Franits generously sent me a copy of Swarm Intelligence: What Nature Teaches Us about Shaping Creative Leadership (2013) by her friend James Haywood Rolling, Jr. This was a most fortunate and timely gift. In his book, Rolling discusses the four laws of swarm behavior, and I want to use those laws to build the core of my MOOC commandments, which I think, will illuminate the interactions between Simon Warren and Laura Gogia and between Linnéa Franits and me. The laws may also provide some concrete guidance for good behavior in a connectivist, rhizomatic MOOC such as #rhizo15. Commandment 1: Thou shalt chase after those ahead of thee. In swarms, most of us are behind someone, and we are to chase after those ahead of us, those "temporarily blocking the path toward a role in the ranks of leadership" (Swarm Intelligence, 91). The ones ahead of us have "modeled a trajectory that leads to the front of the pack", and our chasing ensures a "short-range succession of new leaders one right after another" (91). Yes, most in the swarm are behind someone else, but eventually, almost everyone in the swarm will be on the leading edge at some time or another, but only if they keep chasing. Unlike a hierarchy, a swarm morphs, flashes, shifts, and changes directions so that everyone finds themselves eventually on the leading, or trailing, edge of the swarm, but only if they are chasing. And chasing is not following. Followers usually keep a respectful distance behind their leaders, never pushing them to speed up or change direction. Chasers are always pushing. And always being pushed. In a swarm, just as you are most always chasing someone, then someone is most always chasing you. Enjoy the chase, both ways. For instance, I recently wrote a series of articles and other documents with a swarm of #rhizo14 participants, and it was amazing to watch as with each document a new person surged to the front of the swarm to take the lead. None in the swarm minded chasing, and just as importantly, none minded taking the lead when it was obvious that they were best suited to do so or the situation just turned that way. In The Unsettling Headiness of #rhizo15, Laura invited Simon to follow along with her. With her gifted book, Linnéa invited me to follow her reading. Simon and I will both invite others to follow us. Eventually, Laura and Linnéa will follow us. Or someone else will. Chase and be chased. This is how a swarm works. It is tempting to see this chasing as competitive, but that is thinking in terms of individuals and not the swarm. Chasing pushes those ahead to do more, and it positions those behind to step ahead when the direction of the swarm changes, as it always will. Chasing infuses the swarm with energy, keeps the most energetic on the leading edge, and allows all an opportunity to surge to the front at some time or another. The one in front does not block the one behind, but does work hard to stay ahead while at the same time allowing those behind to draft on their trajectories and surge to the front when a new direction appears. I'm doing some of the best writing of my life in #rhizo. Why? Because I'm chasing Maha Bali, Simon Ensor, Jenny Mackness, Frances Bell, Dave Cormier, Bonnie Stewart, and a dozen others. Every once in a while, I get to lead, but I'm also very happy to follow these brilliant writers and thinkers. This swarm is going fine places that I could never go alone. So when you join a MOOC swarm, chase after those ahead of you, and push hard to position yourself for the front edge. It's your turn when the swarm turns. Turns within turns. Very complex. Good ethics. Commandment 2: Thou shalt not crowd thy neighbor. Swarms are crowded places, and without a rule for maintaining some separation, none of us in the swarm will have room to move, to adjust our trajectories the moment a shift is called for. Rollins says that "swarms behave in accordance with the Law of Separation to prevent a chain of disorienting or disabling collisions that would slow the progress of the group toward its next position" (91). And this separation is required in the physical, virtual, and intellectual domains. No bird in a swarm expects any other bird to occupy the same space, to be the same bird, or to think the same way as they do. Individual moves and trajectories are allowed for, even demanded, all for the good of the swarm. Because there is space between all birds, then no bird is locked into a position, but each can move along its own trajectory through the swarm and yet always within the context of the swarm. This is, as Edgar Morin often argues, freedom defined within constraints, freedom that makes sense only within the constraints of the swarm. My recent writing swarm (I have been in other writing swarms and will, no doubt, be in yet others again) always allowed space for each writer to have their own thoughts and to follow their own trajectories, which sometimes took them out of the swarm altogether as they pursued other interests not germane to this swarm. This freedom to move without the restrictions of an over-arching leader or rule of action constantly fed new energy into the swarm and allowed it to think beyond itself, beyond what any of us could have thought alone. I have never thought this well alone. Never. In the blog post, Laura invites Simon to be a buddy, not a follower or a leader. I sense in her offer, space for Simon to move, perhaps even in ways that will eventually separate him from Laura. That's all good for the swarm. So when you enter a MOOC, give your neighbors room to shift their own thinking, follow their own learning, and transgress their own boundaries. That will give you room to move, someone to chase, someone to push you, someone to align with. Give gap, take gap. Commandment 3: Thou shalt align with those about thee. Rollins says that "swarms behave in accordance with the Law of Alignment to maintain enduring micro-attachments, tightly knit integral clusters that also preserve the fabric of the larger group" (91). This is the complement to Commandment 2: don't crowd, but don't be so loose that you cannot align. Aligning with your buddies acts as the constraint on your own trajectory and keeps you from leaving the flock by accident. If you align to those left and right, above and below you in the swarm, and they align left, right, above, and below, then the integrity of the entire flock is preserved regardless of the turns and morphs it makes. Not only that, but the integrity of your own trajectory is preserved and reinforced as others align to you. Finally, the fabric of this alignment is critical to the empowerment of each and all. No one can keep up with all of the activity and chatter of the flock, but much of this activity will eventually ripple through the fabric of the flock to everyone. Alignment reminds me of a point that Edgar Morin makes about the sum of the parts. Of course, everyone knows that the whole is greater than the sum of the parts, but as Morin wryly notes, the whole is also less than the sum of the parts. Alignment amplifies some chatter in the flock, but it also dampens some chatter. Dampened chatter, if locally valued, may lead to the formation of a different flock, as a few change directions, fork the flock, to pursue a new conversation. The flocks may merge back later on, or not. No harm, no foul, play on. Alignment requires a certain discipline, so some sub-commandments are perhaps called for. Commandment 3a: Thou shalt be alert. You cannot align if you don't know what is happening around you. Wake up. If you are tired or distracted by some other flock (your family or job flock, say), then draft in behind a key rhizo-buddy and cruise until you can return your attention to the flock. So Command 3b: Thou shalt draft when tired and distracted. Command 3c: Thou shalt let others draft behind thee. But people may not know who is in their surround, so Commandment 3d: Thou shalt honk. Send a locator ping every once in a while to let others know where you are. This is a commandment that I too often ignore. I get lost in my reading and too long writing, and I don't surface for a time, and people think I'm dead, or worse. Don't go zombie: tweet, post, comment, like, honk. Honk and listen for honks. Simon Warren honked and Laura Gogia honked back. They aligned. It's a beautiful thing and really easy to do. Moreover, a dozen others of us heard them honking, and we honked and aligned. Now we have a flock. Too easy! Commandment 4: Thou shalt cohere. Rollins says: "Swarms behave in accordance with the Law of Cohesion to prevent any member and his or her contribution to the group from getting lost or overlooked along the way" (92). 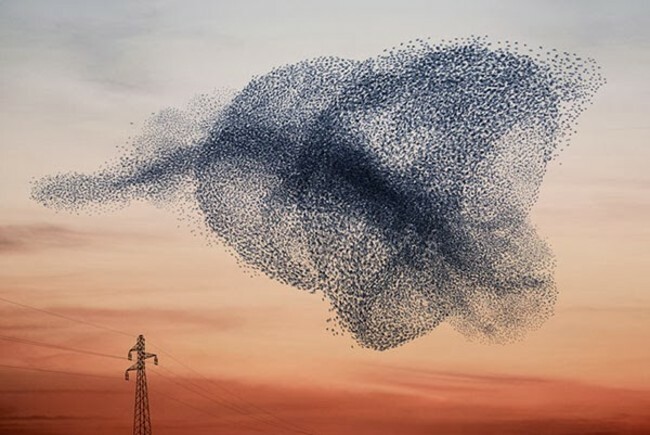 But you might think, looking at a swarm of starlings or fish, how can one cohere with something that dynamic and fluid? Coherence is a proximate thing, a local thing, so you cohere to those in proximity. You cohere to your handful of buddies in f2f reality—handful just because of the issue of overcrowding in physical space. In virtual space, you can cohere with several handfuls, but the principle is the same. You stick with the few you know and that sticks you to the group. Doesn't this create an echo chamber? It can, and that is a most disruptive effect in any swarm as it stops the flow of ideas and configurations within the swarm. A too-tight cluster of swallows who insist on maintaining the exact relationship with the exact same number of other swallows becomes a fascist knot within the sweep and swim of the swarm (sorry … I got carried away). This is as deadly to the elegant progress of the swarm as is a raptor or troll—actually more deadly. 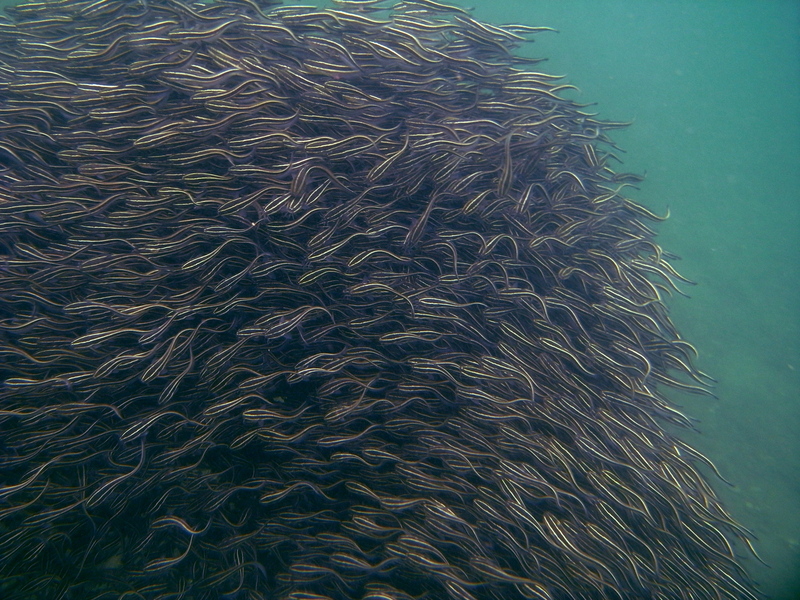 A swarm copes rather capably with predators—splitting and spinning about, then merging and re-emerging—but a fascist group within can be fatal. Flocks deal with fascist echo chambers in a couple of ways. Your proximate surround is always present, but it should never be fixed or static. As we are all chasing, separating, and aligning, our immediate buddies slip in and out, sometimes ahead of us, sometimes behind, sometimes to the left, right, above, below. Or sometimes away. Gaps emerge in the swarm around us, but they are short-lived. We move to close the gap, or someone else moves in to close it. Coherence, then, is dynamic, not static. Swarming is promiscuous if you are thinking of individuals. It is absolutely faithful if you are thinking of the swarm. Promiscuity in terms of fidelity, or fidelity in terms of promiscuity (don't you just love complexity?). I like chasing after Maha, Sensor, and Dave, but I can't limit myself to them or them to me. I have to make room for Linnéa and Len and AK and Kevin and Clarissa and … well, and so many more and all those yet to come. So Commandment 4a: Thou shalt tie no knots. Cohere, but don't cling. Only little kids get to cling. Another reason that fluid coherence works is that my handful of buddies includes Sarah, but Sarah's handful includes people not in my group. Likewise, I have buddies not in her group. Coherence groups are fractal. My group is similar to Sarah's but not identical. Our groups, then, are not only fluid, but they overlap. They imbricate and extend to the whole flock. All are included. So Commandment 4b: Thou shalt imbricate. Commandment 4c: Thou shalt not smother (reverse of Commandment 2, and thus, likely unnecessary, but then probably most commandments are unnecessary, if still occasionally helpful). I don't know James Rolling, but my buddy Linnéa does. I cohere to her, she coheres to him, and as those who study social networks tell us, this makes me coherent with him. We imbricate and don't overlap. Nice little swarm we have going. So when you join a MOOC, cohere with those buddies about you and expect them to move in and out of your immediate surround as they follow their own trajectories and explore other aspects of their own bit of the swarm. That's okay. As Sarah swarms out, Rebecca will swarm in. You will maintain your coherence and the integrity of your identity while revealing new aspects of yourself as you travel with others. It's what swarms do best. Rollins concludes his chapter on swarms with this advice: "In summary, behave like you're part of a swarm—chase ahead, separate from the crowd, align with the pacesetters, and converge upon a goal that benefits one and all" (115). So maybe there are only two commandments, writ small: give gap, take gap; or maybe: find a buddy, be a buddy. There is, of course, more to say. Humanity has been spinning out commandments since … well, since the beginning, but I need to put this out there in the #rhizo15 swarm. I'm chasing some really bright people. I have songs to sing and recipes to prepare. Do We Count in #rhizo15?